You may not know this, but the staff of the Writers’ Program are all writers. Student Advisor Carrie is the author of a young adult novel series, and recently wrote a Ben 10 graphic novel. Program Director Charlie has published several books, including the recent poetry collection, Nanopedia. Program Manager Nutschell writes YA and works in an advisory and/or managerial capacity for several Los Angeles literary organizations. Social media maven and administrator Bree recently had a short film she wrote released on Amazon Prime after a run on the festival circuit. 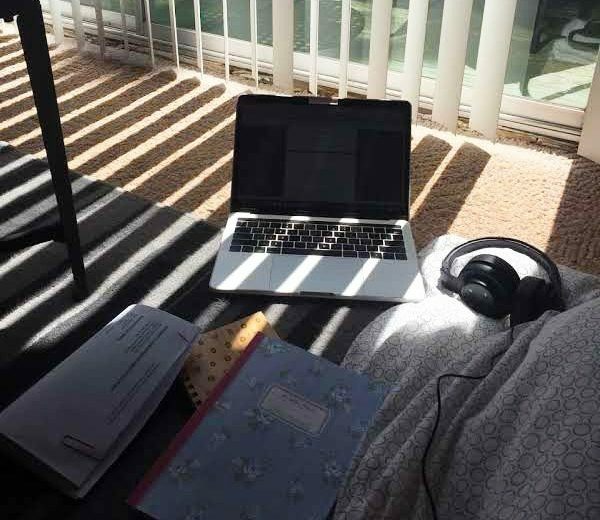 And those are just some of the recent notches on our collective writing belts (to say nothing of the two screenwriting books, Inside the Room and Cut to the Chase, edited by our former Program Director, Linda Venis, with the help of staff). As writers, we also need escapes from the daily grind and time to focus on our projects without (or with greatly diminished) distraction. 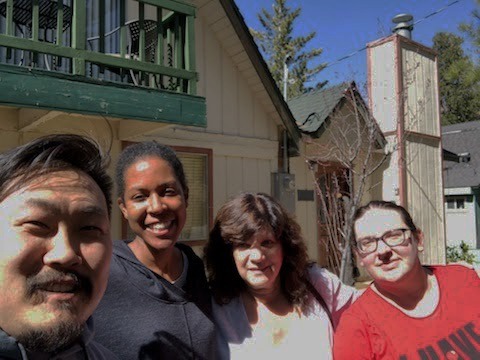 Thus last weekend, three of our current staff (plus our beloved retired Program Manager, Cindy) retreated to a cabin in the Lake Arrowhead area to dedicate some quality time to our projects, which included TV pilots and novel revisions. 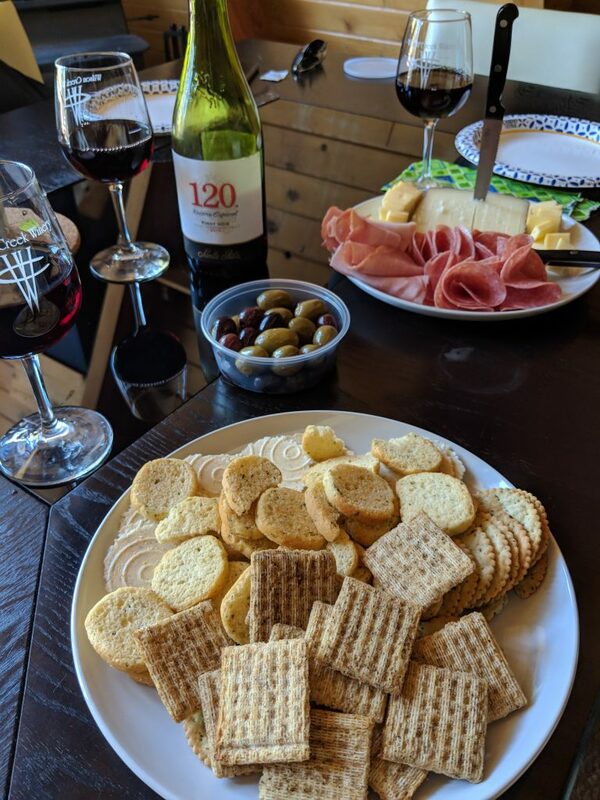 Of course, you can’t spend all day every day writing without experiencing some burnout, so the trip also included an afternoon in Lake Arrowhead, cooking meals together, stargazing, seeing US at the local movie theater, and lots of good conversation. Ashley: It’s rare to find people you can travel with, brainstorm with, AND commiserate with. Writing can be hard. This group made it a blast! 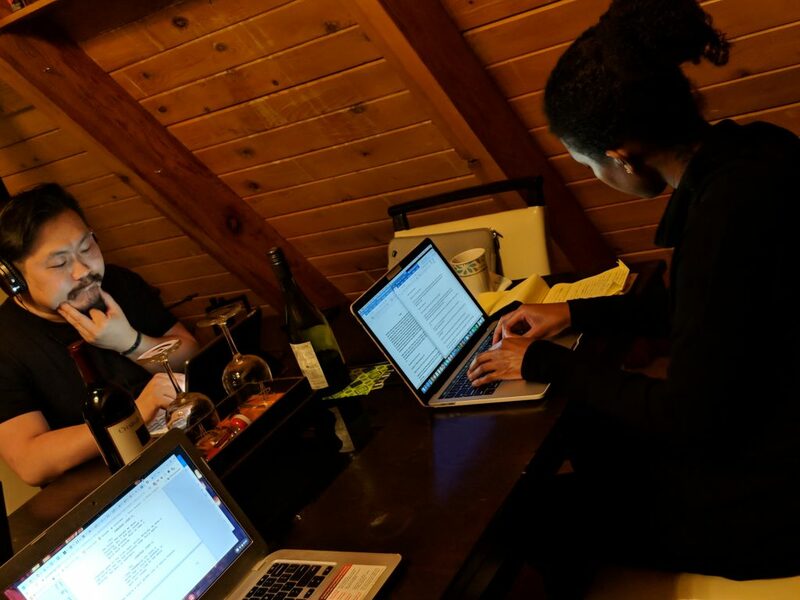 Chae: The perfect alchemy for an ideal writing session includes a cabin in the woods, friends who are writers, wine, and the Beach Boys to drown out the cries of coyotes slaughtering innocent pets. Bree: I was a little concerned about spending four days in a remote cabin with my coworkers. We all get along at work, but close-quarters living is a different scenario. It went better than I could have imagined. Not only were we highly productive, we had a fantastic time together. I’m now hoping this is the first of many staff writing retreats! 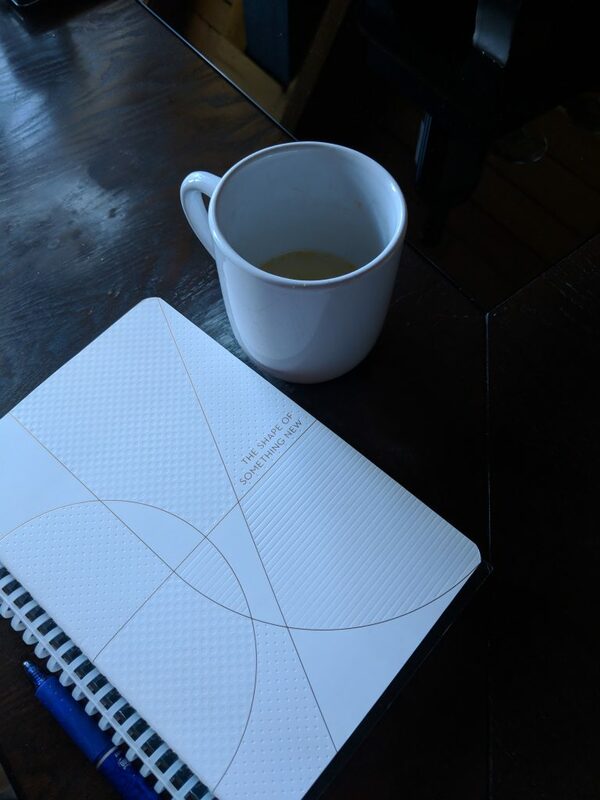 Cindy: Three-plus days in a serene setting with friends who are as passionate about writing as I am. Work got discussed and pages got written. I’m ready to go back! 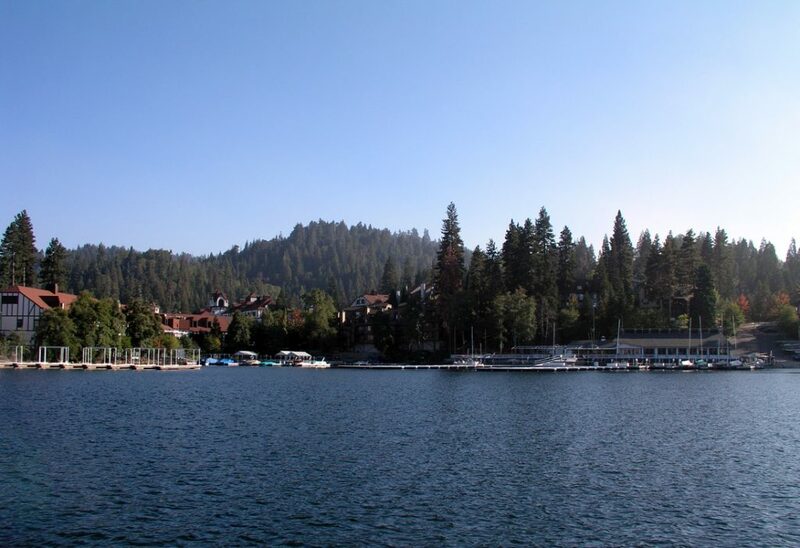 If you’re looking for this kind of inspiring and productive experience, there’s still time to register for our student-focused Writing Retreat at Lake Arrowhead this September. There’s more privacy, more space, and additional amenities you won’t get from the rustic cabin experience, and you won’t even have to sort out who’s doing the cooking or the dishes because all meals are provided!